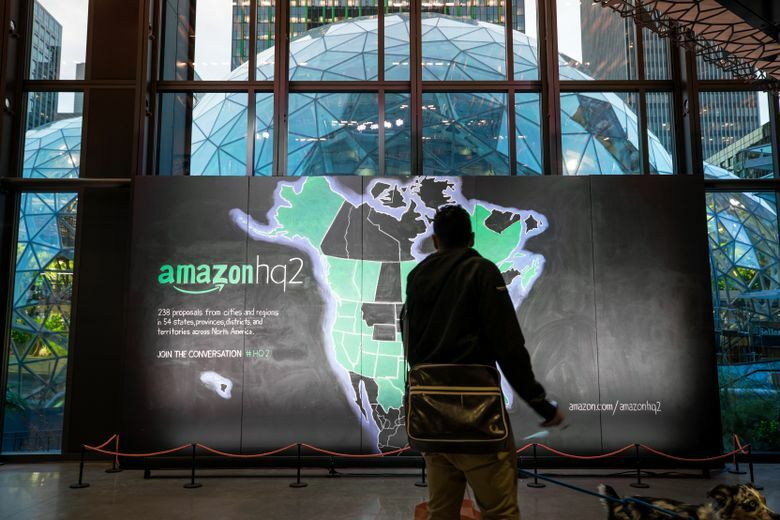 The Amazon HQ2 search mystery has been solved! Or has it? The chosen city could reap 50,000 jobs and $5 billion in investment. Let’s take a look at five possible scenarios for where the company will locate its second headquarters. WASHINGTON — Amazon.com’s search for a site for its second headquarters is now mostly playing out behind closed doors, as officials from 20 finalist locations provide the company with additional materials. Amazon founder Jeff Bezos (who owns The Washington Post) recently starred in the company’s Super Bowl spot. But that’s not what caught the attention of folks in the capital of Texas. The ad opens with an Alexa device giving a tooth-brushing woman a report on the weather in Austin. As Texas Monthly put it, “it’s a big ol’ clue, as far as we’re concerned.” Alexa is later asked to play country music, another obvious reference to Austin! (Unless, of course, it is nod to Nashville). But that’s not all. The spot ends with actor Anthony Hopkins feeding snacks to a peacock, which just so happens to be something of an informal mascot for the city due to the bird’s prevalence in Mayfield Park. One place Sullivan presumably didn’t need to read up on was Montgomery County, Maryland, where her very job was to grow the county’s economy as president of the now-defunct Montgomery Business Development Corp. Just look at how confidently she promotes the county’s business climate in this county cable television program from 2013. The site reported that “the vast majority” of some 6,000 views appeared to come from Amazon and that the traffic source “appears to be an internal Amazon.com page devoted to its HQ2 search.” The article goes on to report how Arlington County, Virginia, was the first place in the country to earn top certification for use of green and resilient buildings — exactly the type of buildings Amazon would like to fill! A week after Amazon began its search and weeks before the deadline to submit information, Bloomberg reported that “several” senior executives advocated putting the second headquarters in Boston. The reasons were many, and believable: Boston has wonderful colleges, a lower cost of living than New York, and Amazon had already purchased a local robot-maker there. Amazon strongly refuted this. “Bloomberg is incorrect — there are no front-runners at this point. We’re just getting started & every city is on equal playing field,” Amazon News wrote on Twitter. However, Amazon did name Boston a finalist. And last month Boston reporters found that the company was negotiating a deal for up to 1 million square feet in Boston, which could be a precursor to HQ2! Earlier this month, sleuths at the Raleigh News & Observer determined that multiple bidders had referenced ‘project Golden’ in their Amazon responses. “It is with great enthusiasm the Hickory [area] submits the attached response for project Golden (HQ2),” wrote Catawba County, N.C., economic development official Scott Millar to the company with its bid. Catawba County was not named a finalist but perhaps Millar’s wording let slip the project’s code name, which sounds a lot like a reference to the Golden State, aka California, aka the home state of HQ2 finalist Los Angeles. Humph. Well, it appears that some local economic development officials simply misread the search materials.